Log in to your Adobe Revel account. Launch the application on your Mac or iOS device. Sign in using your e-mail address and password. If you haven’t created an Adobe ID, you can choose the option to create a new account. After you log in, you see the photos you have in your Carousel (library) or photos you imported from a Photoshop.com library. Tap a photo in iOS or click a photo on the desktop app. The view changes to an editing view where the editing tools are available, as shown. Favorites: On iOS devices, the Favorites icon is represented with a heart. On desktops, the Favorites icon is a star. Tap or click the icon, and the photo you’re viewing is added to your favorites. Comment: Tap the Comment icon, and a comments panel opens so that you can type a comment. Slideshow view: The first icon at the bottom left of the window is used to run a slide show. This icon works if you tap an album. If you have a single photo selected, tapping this icon prevents you from swiping to change photos. To exit the Slideshow view, tap anywhere outside a photo or press the Esc key on your keyboard. Keyboard: Tap this icon, and the keyboard pops up on iOS devices. You can type a caption that’s added at the bottom of the photo. On the desktop version, a panel opens that provides a number of different sharing options. Edit: Tap this icon to enter editing mode. You have choices for making an auto fix, changing white balance, adjust exposure and contrast, make red-eye corrections, and crop and rotate a photo. The best way to familiarize yourself with the editing tools is to play with them and make changes for auto correction, exposure, contrast, cropping, and rotation if needed. 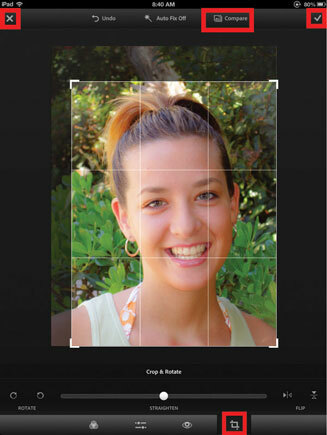 This figure shows a photo targeted for cropping. Delete: Click the Trash icon to delete a photo. Compare your edits with the original photo. To make a comparison between your edits and the original photo, keep your finger pressed on the Compare icon at the top of the window. While your finder is depressed on the icon, you see the original photo before any edits. When you release your finger from the icon, you see the photo as you have edited it. Tap the check mark at the top-right corner of the window, and your edits are saved and the file is updated. When updated, the new edited file appears the same on all your devices. Tap the X icon at the top-left corner and you return to your library view.